Among citrus fruits, Citrus × latifolia (Yu. Tanaka) Yu. Tanaka stands out given its diverse uses, and there is a great demand for plants of high phytosanitary and genetic quality. 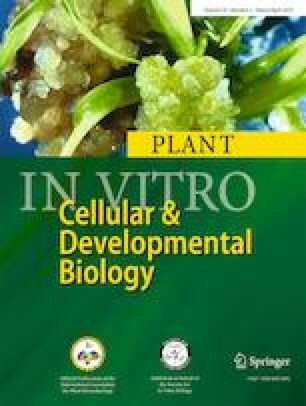 In the present study, the in vitro micropropagation process of C. latifolia was studied in RITA®-type bioreactor, semisolid medium, and partial immersion with liquid culture medium. Explants that were 2 mo of age were used and apices of 0.5 cm were extracted and placed in each culture system. In all the systems, MS (Murashige and Skoog) culture medium was used, supplemented with 6-benzylaminopurine (BAP) and kinetin (KIN). After 30 d, the number of shoots, the size of the shoots, the number of leaves, and the depletion of nutrients from the culture medium were analyzed. With the data obtained, ANOVA and Tukey’s mean comparison tests were performed. The RITA® bioreactors, with the addition of 40 mL of medium per explant in a 4-h-interval immersion, facilitated the production of the greatest number of shoots compared to the other culture systems, and also resulted in the highest levels in medium nutrient depletion. The authors wish to thank the Comité Ejecutivo Nacional Sistema Producto Limón Persa A. C. Cuitláhuac, Veracruz, México, for their support.